After the post we did on benefits of steaming your hair (read HERE), we had many of our beautiful kamdolls asking more questions regarding this and how they could do theirs at home. So we will discussing in details how to steam your hair yourself. Sometimes we are too tired to go to the salon or we feel we can do these things better. It is totally OK to opt for alternative ways to get things done. Steam your hair at home usually doesn’t require the use of hair dryer or hooded dryer. By now we all know all the wonderful benefits of steaming hair, one of which is the fact that it helps increase the flow of natural oils produced by your scalp thereby stimulating hair growth and eliminating dryness especially for natural hair. 1. Wash your hair properly. 2. Add deep conditioner to your wet hair and distribute evenly, massaging your way through every inch of your scalp with your fingers. 3. Soak towel or turban towel in water. – Then heat the face towels in the microwave for about 60 seconds or until they are warm. 4. Put on a pair of thick gloves, wring the towel out lightly and place on your hair. 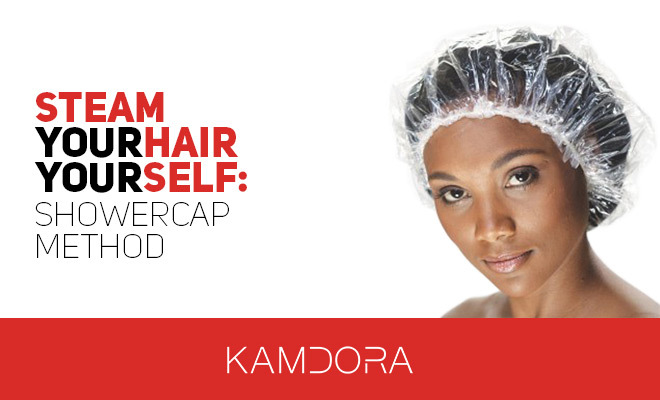 -Then cover with one of the shower caps big enough to cover every end. 6. Leave for a little over 30 minutes. This is because no direct heat (from dryer) is available to speed up the process. 7. Take off the caps and towels and let your hair sit for 5-7 minutes before washing off with water at a temperature you can stand. Kamdolls, you can get daily tips from kamdora by simply sending K to 38261 (for MTN subscribers only)… xoxo! Is there a home made recipe for a conditioner you can share please? Go online to facebook and you can get recipes for home made conditioner. I so much like this info because it really intrest me.my question is can I wash the deep conditioner off with shampoo and conditioner? (2) can I use hair mayonniase,honey and olive oil as Deep conditioning? I”ll b glad if u reply me cos I want to steam my hair in few days. Yes you may but it is highly dependent on the make/type of the conditioner. Thanks alot for the recipes,but my question is: can we make use of more than one of the recipes? This is an educatind thing. I love it. Keep it up by making women look glooming always.